Athletes taking a political stance against something is absolutely nothing new. Times being what they are, it's no surprise that we're witnessing more and more athletes show their activism by protesting in revolutionized ways. Most recently, Colin Kaepernick, quarterback for the 49ers and Myke Tavarres, rookie linebacker for the Eagles, have opted not to stand during the national anthem in response to America's treatment of minorities. "We've got an issue in this country in this day and age, and I feel like somebody needs to step up and we all need to step up," Tavarres said to ESPN. "We've got that right. There's just a lot going on that people don't want to talk about, and I feel like us as athletes, we're looked at as role models. And I feel like with Colin Kaepernick, he's doing a great job for standing up in what he believes in, and most people may not like that, but that's his opinion, he's entitled to it, and I respect him for doing it." Tavarres later decided to stand for the anthem. What Kaepernick is standing for is a form of protest just like Tommie Smith and John Carlos holding up their fists at the 1968 Olympics and Muhammad Ali denouncing the Vietnam War. 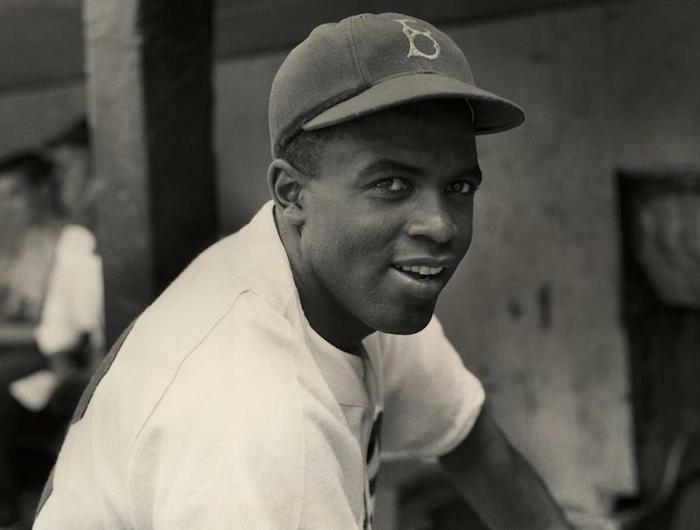 One famous black athlete, in particular, wrote about his feelings on the national anthem, and that athlete is none other than America's great baseball legend, Jackie Robinson. Photo: AP In his autobiography I Never Had it Made, published shortly after his death in 1972, Robinson wrote the following excerpt: "There I was, the black grandson of a slave, the son of a black sharecropper, part of a historic occasion, a symbolic hero to my people. The air was sparkling. The sunlight was warm. The band struck up the national anthem. The flag billowed in the wind. It should have been a glorious moment for me as the stirring words of the national anthem poured from the stands. Perhaps, it was, but then again, perhaps, the anthem could be called the theme song for a drama called The Noble Experiment. Today, as I look back on that opening game of my first world series, I must tell you that it was Mr. Rickey’s drama and that I was only a principal actor. As I write this twenty years later, I cannot stand and sing the anthem. I cannot salute the flag; I know that I am a black man in a white world. In 1972, in 1947, at my birth in 1919, I know that I never had it made." Kaepernick lives in a world different from the world Robinson, Smith, Carlos and Ali grew up in. This is not to compare them and say that all of them are they same. They are not. However, the actions of protests are rooted in controversy, and anytime someone goes against the mainstream or does something that is unpopular, you better believe the media clapback will ensue. After Ali's passing earlier this year, people across the nation revered the beloved champion for what he stood for, and he deserved every drop of that reverence. Yet certain people seemed to forget why Ali protested the war in the first place or that he was vilified by the media as well. The vilification was oh so real. He was one of the most hated public figures in America. And at the time of Ali's stance, many other athletes and public figures viewed him as being too radical, including Jackie Robinson. You may agree or disagree with Kaepernick's decision, but this is how he chooses to protest, and his protest is peaceful. The situation is layered, but Kaepernick's actions shouldn't be taken at face value. People in protest are rarely ever popular in the mainstream at the time they are protesting, but at the end of the day, Colin Kaepernick isn't fazed about it. Robinson and Ali were also unbothered. History is making a loud statment about black athletes and their relationship with America...again. We hear you.